California is America’s undisputed clean energy leader, a kind of cultural and economic island, liberal enough to pass bold climate policies and big enough (the world’s sixth-largest economy, were it a nation) for them to matter, economically and environmentally. But the state faces a much more difficult decision when it comes to its electricity system. For years, it has been arguing about whether to connect its grids with nearby states in a larger regional market system, along the lines of several regional markets in the eastern US. Proponents claim that joining a regional market would bring numerous benefits, principally in lower prices. But a coalition of labor, consumer, and environmental groups warns that it also comes with risks, most notably the loss of California’s ability to control its own energy fate. Just how much control it would surrender is the subject of fierce debate, as we’ll see. This decision carries enormous stakes. If California joins a regional market, it could create one of the largest energy markets in the country and complete, or come close to completing, the long-stalled march of electricity market deregulation. Most Americans would live in areas where power generators compete on open markets and transmission is regionally coordinated, which could lead to further cooperation and grid linkage. A larger market could further drive down the price of renewable energy and help California deal with the challenges of integrating renewables. Many proponents see regionalization as the inevitable next step in decarbonizing the US grid. California Gov. 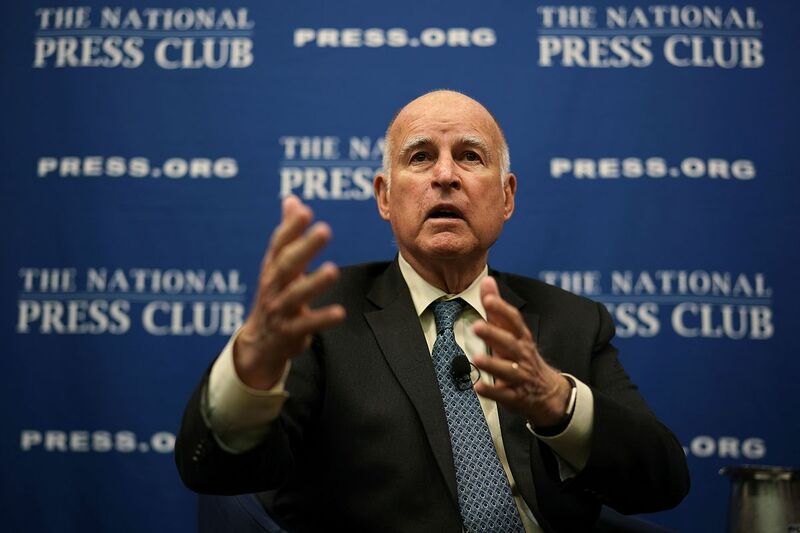 Jerry Brown really wants a regional energy market. If California decides not to join, regional coordination would inevitably be diminished and regional transmission coordination made more difficult. The current model of multi-state market cooperation could be cast into doubt. But California would retain ironclad control over its own clean energy policies. It’s a big decision, and there are lots of moving parts, a lot of unknowns, and lots of technical, economic, and political twists. (A big piece of all this involves trying to predict what the Trump administration will do — no easy task.) It’s a genuinely tough call. Having absorbed as much of this stuff as will fit in my aching brain, I’m going to try to distill it down to readable, user-friendly language. We’ll walk through the decision from end to end, starting with a short primer on energy markets, covering the case for regionalization, detailing the fears and objections of opponents, and concluding, as such posts must, with some deep thoughts. It’s going to be great! There are two parts to it: retail and wholesale. Retail deregulation, somewhat less widespread, refers to areas in which electricity customers can choose their own power providers. (The utility still handles billing and the distribution grid.) There’s some interesting stuff around retail choice going on in California, but that’s not the focus of this post, so let’s not get distracted. Wholesale deregulation refers to the power generation side of the business. In traditional regulated markets, “vertically integrated” utilities run everything — they own the power plants, generate the electricity, and distribute it to customers. In deregulated wholesale markets, power generation is split off, owned by separate generation companies that compete on an open market. “Distribution utilities” buy power from that market and distribute it to customers, but they are not allowed to own generators. The markets in which power generators compete are administered by Regional Transmission Organizations (RTOs) or Independent Service Operators (ISOs). (For our purposes, basically the same thing.) These are nonprofit, independent organizations, designed to be unaffiliated with and uninfluenced by market participants. The line between state jurisdiction (energy policy, local energy distribution grids) and federal jurisdiction (transmission lines and wholesale markets) used to be fairly clear, but these days it has gotten a bit fuzzier. New market participants like batteries are often mandated by state energy policy and implemented on local distribution grids, but directly affect wholesale energy prices, and FERC has mandated that they be allowed to participate in wholesale markets. Possible tension between FERC and state policies (which we’ll examine more closely in a minute) is a big part of the decision California faces. 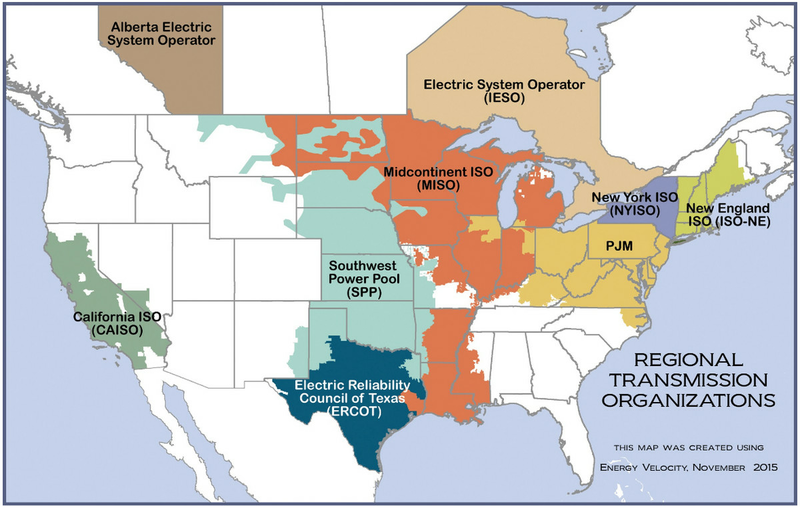 You’ll notice that three of the ISOs on the map above share an important feature: CAISO (California), NYISO (New York), and ERCOT (Texas) each encompass only one state. That means the ISO does not have to balance multiple state interests; it can more readily align with state policy. California’s situation is unusually bespoke. CAISO’s board of directors is appointed by the governor and approved by the state Senate. It is the only North American ISO with that governance structure; in other ISOs, the board is appointed by an independent committee and state policymakers play only an advisory role. So California currently has a competitive wholesale market in which there is a unique degree of shared vision among state regulators, legislators, and the ISO. Everyone is pulling in the same direction. And CAISO is, state wonks are fond of claiming, the best-run ISO in the country. The question facing California — in the form of Assembly Bill 813, currently being debated — is whether to work with as many as 15 nearby states to form a larger regional ISO, something more along the lines of PJM in the East. Before looking at the risks of that choice, let’s take a look at the benefits of regionalization — the reasons California’s Gov. Jerry Brown, the state Chamber of Commerce, renewable energy developers, and environmental groups like NRDC support it. It’s important in this debate to keep two things distinct: the benefits of regionalization, i.e., of trading energy over a larger geographic area, and the benefits of regionalizing via a multi-state ISO during the Trump administration. They overlap but are not the same. The benefits of regionalizing in the first sense are widely understood. As I’ve described in detail (see here and here), when a grid integrates more wind and solar power (variable renewable energy, or VRE), it begins experiencing new, more extreme swings and ramps in energy supply and demand. That calls for greater flexibility on the grid. Unless such flexibility is added, grid operators eventually must “curtail,” i.e., shut off, VRE at times of particularly high production. It’s getting to the point that curtailment is affecting investment forecasts. “The balkanized, fragmented state of Western markets is starting to factor into resource-owner energy output and revenue forecasts,” said Matthew Crosby, policy director for Coronal Energy, a renewable energy developer. 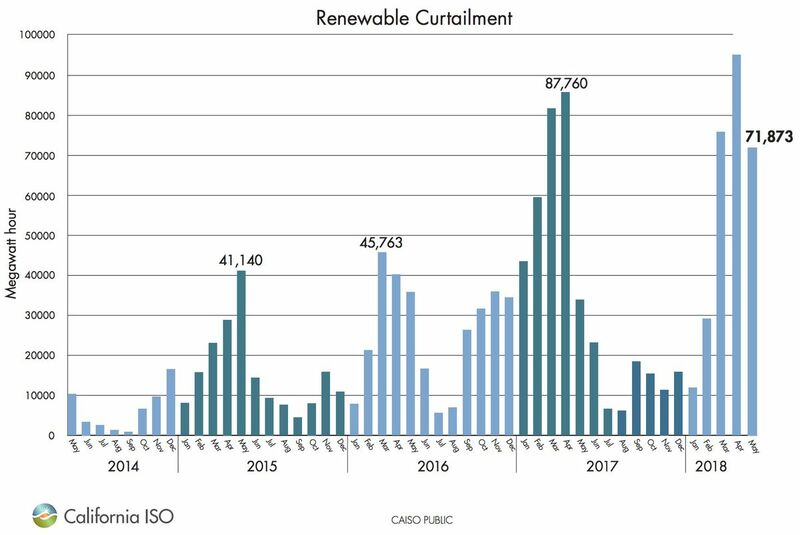 In other words, curtailment is beginning to mean real money. There are numerous ways to add flexibility to the grid. In one direction, toward more local solutions, you can “intensify” the grid, adding more storage and other distributed energy technology, creating more microgrids, and bringing more demand under control so it can be shifted to meet variable supply. All these solutions allow existing grids to absorb more VRE. In the other direction, you can grow the grid, extending its boundaries over a broader geographic area. That’s what the ISO decision is about. With a more “bigger, more liquid, and transparent market,” energy analyst Paulos writes, there are more customers for cheap renewable energy; California can export what it would have curtailed. And California can make use of “a greater variety of excellent resources, such as wind energy in Wyoming, Montana, and New Mexico.” A larger grid can absorb more VRE. A regional market would allow for a single entity, the ISO, to coordinate transmission planning. 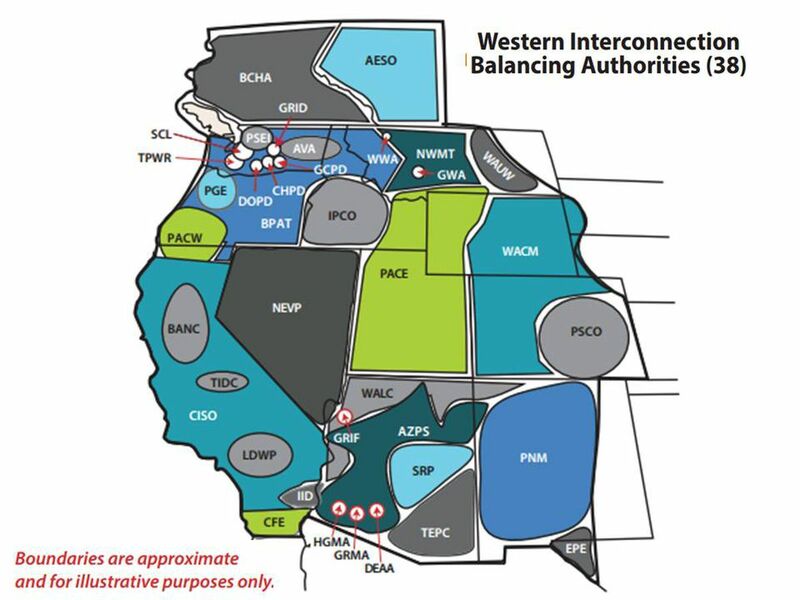 Right now, planning and spending for long-distance transmission lines in the West is broken up over a bunch of different jurisdictions, using different procedures and formulas to make decisions. An ISO could weigh all proposed lines using the same formula for benefit and cost sharing. The result would be a smarter transmission grid that more efficiently carries cheap renewable energy to where it is needed, lowering wholesale power prices. Every individual “balancing authority” in the West (there are 38) is required to maintain a minimum backup reserve, i.e., some power plant capacity put aside for “just in case” — a surge in demand, a power plant flipping off unexpectedly, or some other unforeseen event. (The standard reserve margin is around 15 percent, though it varies with circumstances and the size of the area.) Because every balancing authority maintains its own reserves, there’s a massive amount of duplication. Joining into a single regional market would allow shared reserves and far greater efficiency. Similarly, every balancing authority has to have enough “peaker” capacity to meet its own local peaks in energy demand. Sharing energy over a wider area would allow peaks to be “shaved” and some (expensive) peaker plants to be retired. So: more renewables, better transmission planning, lower reserves, fewer peakers, lower prices, and less coal. What’s not to like? Consumer groups, labor groups, a few environmental groups like the California Sierra Club, and a few wonks have raised alarms and warnings about California’s regionalization plan, some more plausible than others. But if you have a dark political imagination — and shouldn’t we all by now? — it’s not difficult to conjure scenarios in which things go poorly. Some of these groups argue in favor of grid intensification, more local energy and distributed resources, rather than an expanded grid as a way to add flexibility and accommodate more VRE. However, a) expanding the grid is a much cheaper form of flexibility, and b) we will have to do both eventually. If you make the grid bigger, you don’t solve the challenges of integrating VRE; you just delay them. Fully decarbonizing electricity will inevitably involve enormous amounts of both — expanding and linking grids, and intensifying them with smart distributed energy technology. Eventually California will be “throwing batteries” at the grid as fast as it can, no matter how broadly it expands its grid. There’s no other way to fully decarbonize electricity. So there’s no reason to see the strategies as in tension. Plenty of this happening in California too. The second set of worries, shared across virtually all the groups opposing a regional ISO, has to do with the nature of regionalization — specifically, the governance issues involved in moving to a multi-state ISO. Part of their argument is that once California makes the decision, there’s no going back. As described earlier, CAISO has a structure unique among ISOs: Its board is chosen by the governor and approved by the state Senate. That has helped create consonance among all the various regulators and policymakers involved in state climate policy. Will a multi-state Western ISO allow or enable California to pursue its carbon and energy goals in the same way? AB 813 attempts to exercise some control over the situation by laying out a list of 17 principles that power companies must agree to before state regulators will allow them to participate in a regional market. However, as opponents point out, once the ISO is created, those provisions have no legal force. California will not have control over the ISO and will have no way of bending the ISO to its will. If the ISO is created and goes on to violate AB 813 provisions, the only recourse California will have is to withdraw from the ISO entirely. But remember that 2004 case in DC Circuit Court? The judge told FERC that it could not dictate new terms to CAISO, but that it could reject any future ISO application that had a similar structure. If CAISO leaves behind that structure to join a broader ISO and then changes its mind and withdraws, there’s no reason to think FERC will allow it to return to its old structure, with its tight coordination between the CAISO board and state policymakers. That means, in a very real sense, the decision to regionalize via an ISO is a one-way street. Once CAISO merges into a Western ISO, there’s no going back. It is a fateful gamble. So what could go wrong? Let’s look at some of the specific fears opponents raise. Opponents of regionalization mostly focus on a few fears. Most importantly, they point to the dangers of exposing California to greater control by the Trump administration and FERC, to which President Donald Trump has now appointed three out of five commissioners. 1) How will FERC implement California’s carbon price? California’s price on carbon, via its cap-and-trade system, has been underdiscussed in the regionalization debate. But given the work the price is expected to do to reach the state’s ambitious carbon goals, it is vitally important. It’s also complicated, and tricky, in the context of a Western ISO. By way of background, since November 2014, California has been running a Western Energy Imbalance Market (EIM) which involves parts of eight Western states. (Think of it as “soft regionalization.”) The EIM gives California someplace to export VRE rather than curtailing it, and it gives power plants in the West access to the big California market. Currently, the EIM is only a “real-time” market — an hourly market based on the gap between what was procured in the day-ahead market and real-time energy demand. It’s fairly limited, but it has been a resounding success, saving California ratepayers hundreds of millions of dollars. There are proposals to expand the EIM to day-ahead markets, and we’ll look more at that in a second, but for our purposes here, the thing to note is that the EIM is a voluntary market. Power plants choose whether to join and bid in. And if they bid in, at least to California’s part of the EIM, they agree to report their carbon emissions and pay a “carbon adder” reflecting those emissions. In this way, California straightforwardly applies its carbon price to imports. That carbon adder represents the only FERC-approved tariff in a FERC-administered market that reflects a carbon price. And FERC made it clear when it approved the tariff that it was doing so only because it was voluntary. So how would California enforce its carbon price in a multi-state ISO? Will all states in a Western ISO have to report their carbon emissions, even in states with no carbon price? 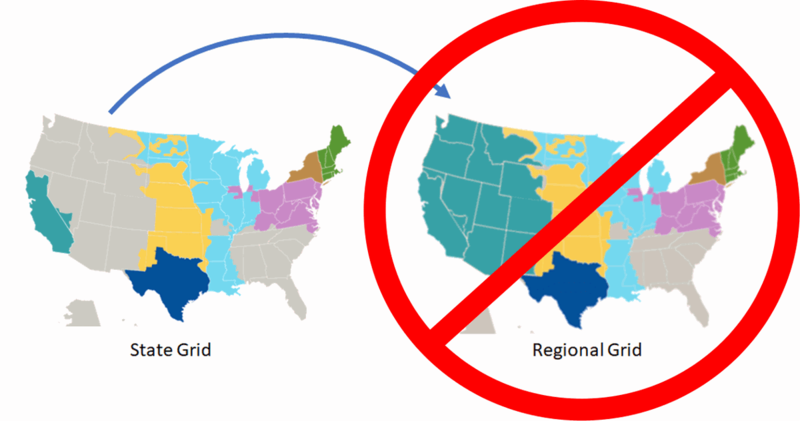 FERC won’t allow a carbon price to be imposed on other states, so how will carbon-priced power be distinguished from unpriced power once it is fed into the regional grid? One possible answer is that trade with California is made voluntary, subject to a carbon adder. According to Danny Cullenward, an energy analyst and lawyer at the climate nonprofit Near Zero, “If all one can do is replicate the voluntary trading rules, where out-of-state generators choose whether or not to sell to California, then the final market would look exactly like the CAISO EIM” (or at least an expanded, day-ahead EIM). The question of how to implement California’s carbon price over a multi-state area has not been sufficiently answered. It’s never been done before, and there’s no reason to think a FERC dominated by Trump appointees will be particularly helpful in implementing it. “Given the complexity of [designing a carbon tariff], and the likely opposition of out-of-state generators, the absence of any workable proposal raises serious questions about whether California’s policies can be effectively applied to an expanded CAISO market,” said Matt Freedman of the The Utility Reform Network. 2) California might get a capacity market it doesn’t want. Another fear: California might get stuck in a system with a capacity market, forced to pay to keep old fossil fuel plants open and subject to the fossil-friendly shenanigans FERC has been pulling in capacity markets elsewhere. There’s an endless argument over whether capacity markets are a good thing. (This author’s opinion: They are not.) But one thing is for sure: California does not have one and does not want one. Instead, to maintain reserves, it requires each balancing authority to maintain a minimum reserve of its own. What if the ISO creates one and dares California to leave? Or what if it creates one involving all the states in the ISO except California? Since the state still imports a good portion of its power, the price and emissions effects of a capacity market would still reach its consumers. Again, California can pull out of the ISO if this happens, but it can’t go back and recreate the same CAISO it left behind. 3) Labor supports California climate policy because of in-state jobs. California’s renewable portfolio standard (RPS) has a “bucket” system that requires a certain amount of clean energy (“bucket 1”) to be procured from within the ISO. Right now, since the ISO only covers California, that means in-state renewable energy projects, which mean in-state jobs. That is the key reason labor has supported the RPS and state clean energy policies more generally. If the ISO covers all Western states, a lot of “bucket 1” procurement is likely to shift to, say, cheap wind in New Mexico. That means fewer in-state jobs, which is the main reason state labor groups have been wary of regionalization. A measure in AB 813 (395.5a) attempts to avoid this outcome by arbitrarily restraining the boundary of the ISO to California for RPS purposes, but Near Zero energy analyst Cullenward worries that it is vulnerable to dormant commerce clause challenges in court. 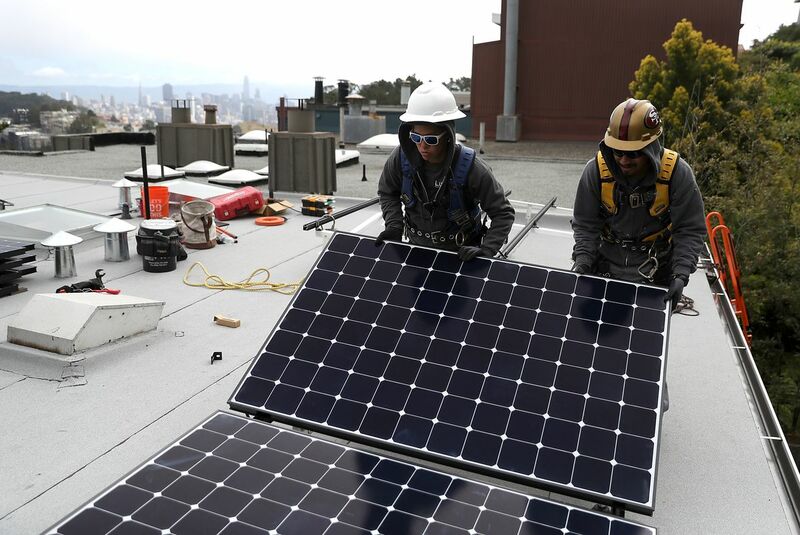 Regardless, proponents argue that the number of jobs possibly lost to this shift would pale before the jobs created as California sprints toward net-zero carbon. 4) Trump’s proposed coal bailout can’t touch CAISO, but it could affect a Western ISO. Trump is pondering a crude coal bailout involving national emergency powers in the Federal Power Act. For all intents and purposes, it would force utilities to pay to keep coal plants open. Right now, there are no coal plants in CAISO territory, so it wouldn’t affect Californians at all. But if the bailout involved FERC-approved tariffs across a Western ISO, Californians would end up chipping in to keep the West’s aging coal plants open. As proponents say, all else being equal, more competition will kill coal plants. But all is not equal as long as Trump is in office — or at least, it’s a gamble. 5) FERC is abetting subtler coal bailouts. As I described in detail in March, FERC is also getting up to some more subtle but shady efforts to save coal. In a nutshell, PJM in the mid-Atlantic and ISO-NE in New England are arguing that state clean energy policies are a kind of market distortion that FERC should allow them to “correct” by, for instance, implementing minimum offer price rules (MOPRs) in capacity markets. A MOPR would require capacity bids to meet a minimum price that would often exclude cheap renewables, helping keep higher-priced coal (and nuclear) alive. There’s no reason FERC couldn’t decide that MOPRs should apply to energy markets as well; the reasoning would be unsound, but FERC has been heading in that direction. Other states in the Western ISO might appeal to FERC that California’s strong RPS — or its innovative policy efforts on distributed energy, batteries, and electric vehicles — amounts to market distortions that affect the wholesale price of power and should be counteracted by MOPRs, tariffs, or some other mechanism. Without any direct control over the ISO, California would have no recourse in response but to appeal to FERC, and no option if rulings go against it but to exit into the chaos of trying to recreate CAISO. One alternative to regionalizing via a Western ISO is doing so by expanding the EIM — making it a day-ahead market and bringing in more states. The idea has proponents, e.g., the Clean Coalition, which argue for a combination of expanding the EIM and intensifying the grid. It would enable broader energy trading, allowing California to export its cheap solar and perhaps import more cheap Western renewables. And it would shave peaks. But, crucially, it would not involve any regional transmission planning, which is the biggest contributor to savings under the ISO plan. That’s not to say no regional transmission planning would be possible without an ISO, but it would be more challenging and bespoke. And not everyone believes that expanding the EIM is as easy as all that. “You hear a lot of people in California that are afraid about a Western market floating this as a proposal, a plan B,” said Wisland, “but you don’t hear a lot of participants in the EIM saying, ‘Sure, we’d be open to joining a day-ahead EIM’.” After all, participants would be handing over control of most of their dispatch to California; it’s at the very least uncertain whether or how many generators outside the state would go for that. “The EIM is like living together before you get married,” California Public Utilities Commission Chair Michael Picker once said of the evolution of regionalization, “then you get married and buy a house.” That’s how proponents see the Western ISO. The question opponents have raised amounts to: Do you want Donald Trump to preside over your wedding? It says in AB 813 that no new ISO governance structure will be put in place until 2021, but that’s a big assumption that Trump will lose reelection. Why not just wait and see? To stick with Picker’s metaphor, perhaps it’s better to live together a while longer, maybe buy a car together, a pet, and some plants, and then see if Trump is still around in 2020. Revisit the issue then. So, at long last (I apologize for testing your patience), where does all this leave us? Here’s how I’ve come to think about it. For California, joining a regional ISO is a gamble that things will go how they are supposed to go, how they ought to go, in a rational world administered by reasonable people. A well-run Western ISO ought to increase competition and drive out coal. It ought to work thoughtfully with California to find a way to support its carbon price and other clean energy policies. It ought to improve regional transmission planning, reduce duplicative reserves, shave peaks, and substantially lower the cost of wholesale power, with great benefits for ratepayers, jobs, and state economies. And I am still enough of an optimist to say that’s probably how things will go. Absent political absurdity, the regionalization of grids — eventually linking them nationally and even internationally — is the cheapest way to integrate more renewable energy. It has to be done eventually. But recent events have offered plenty of reason for cynicism about politics. No subtlety here either, from San Diego 350. There’s nothing explicitly saying that fossil fuel states like Wyoming (which gets 80 percent of its power from coal) have to endorse California’s clean energy agenda to join a common ISO. But the practical effect of uniting Western grids will be, sooner or later, to make renewables cheap as hell — if things go how they ought to go. Wyoming, a deep-red state, loves its coal plants. If Wyoming thought that joining a Western ISO meant sacrificing its coal plants, it probably wouldn’t do it. If Wyoming is willing to join the ISO, it must have some kind of faith that things won’t go how they ought to. A Western ISO shouldn’t view California’s clean energy policies as market distortions. It shouldn’t try to implement MOPRs or other tariffs to support big baseload plants, or try to create a capacity market around California’s objections. FERC shouldn’t allow any of that. Trump shouldn’t invent new executive powers to bail out coal plants. But lots of things happen that shouldn’t. If 15 states in the West end up in an ISO together, it seems clear that a subset of them will be working on the assumption that they are pulling something over on another subset — that one or the other is wrong about how things are going to go. Arc-of-history arguments still have their appeal, and the arc of history bends toward cleaner energy and wider grids. But we have seen some rude interruptions of the arc of history lately, to the point that some of us (hi) have begun to wonder whether it exists at all. If it does, it is certainly not without turbulence, as current times illustrate on a daily basis. It’s not ridiculous for some Californians, miraculously still in control of their pocket of progressivism, to believe that the times call for a defensive crouch. Previous articleAmericans are eating way more fat. But it’s not butter.